“We are going to continue that same tradition of honor, integrity and dignity on the court that you can be proud of,” Chief Justice Randolph told about 80 Chancery Clerks gathered in Jackson for the annual Chancery Court Clerks Conference. 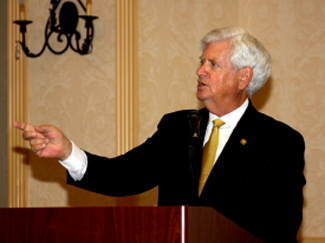 Chief Justice Randolph became the leader of the Mississippi Judiciary on Feb. 1. He said that he is still assimilating all of the new administrative duties and responsibilities that come with the position. Approximately 48 statutes and two references in the Mississippi Constitution address duties of the Chief Justice. In his first day as Chief Justice, he swore in Justice T. Kenneth Griffis of Ridgeland as the newest member of the Supreme Court. Later the same day, he appointed Judge Donna M. Barnes of Tupelo as Chief Judge of the Court of Appeals and swore her in to her expanded duties. Chief Judge Barnes is the first woman to lead the Court of Appeals. In the past five days, he’s made a multitude of special judge appointments for trial courts throughout the State. He said there were 379 special judge appointments last year. He also has met with legislators on issues including criminal justice reform and proposed revisions to guardianship and conservatorship laws. “If the Legislature passes it, we will examine it for constitutionality if it is contested. If it’s constitutional, that’s the last word. The people you elect and send to the Legislature should be making the laws,” he said. The Supreme Court will continue its emphasis on timeliness in its decisions. He repeated the adage, “Justice delayed is justice denied.” Former Chief Justice Jim Smith in 2004 pushed the justices to overcome a backlog of cases and render decisions within 270 days from the completion of case briefing. That goal was achieved later in 2004 and has been the standard of the Court since. Chief Justice Randolph affirmed that policy will continue. He will continue to push for implementation of Mississippi Electronic Courts, the state trial court records e-filing system modeled upon that used by federal district courts. Chancery Courts in 58 counties currently utilize MEC. E-filing Chancery Courts are available to about 80 percent of the state’s population. During 2018, Chancery Courts in Washington, Claiborne, Smith and Covington counties implemented electronic filing. The next Chancery Courts scheduled for MEC implementation are those in Wilkinson and Greene counties.